Imagine having the perfect home and lot, but suddenly you need additional space for in-laws, or a child home from college. 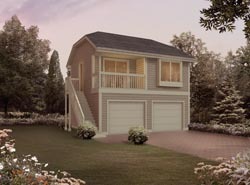 Why not look at our apartment garage plans to suit your needs? Apartment garages are a great way to add the additional space you long for, while offering privacy for the entire family. Comfortable and cozy, today’s designs provide serious comfort and great livability. This may also be a great option for a vacation getaway or home office. The possibilities are endless with one of these great, flexible designs. 511 Sq. Ft., Width 28'-0", Depth 22'-0"
741 Sq. Ft., Width 40'-0", Depth 22'-0"
598 Sq. Ft., Width 28'-0", Depth 30'-4"
1128 Sq. Ft., Width 42'-0", Depth 28'-0"
975 Sq. Ft., Width 42'-0", Depth 28'-0"
540 Sq. Ft., Width 28'-0", Depth 25'-0"
House Plans and More's collection of project plans includes versatile apartment garage plans featured in many different styles and sizes perfect for all of your ever-changing needs. We offer detailed floor plans so a buyer can easily envision the finished result, down to the littlest detail. With a wide variety of apartment garage plans to choose from, we are sure that you will find a stylish design to fit your needs and lifestyle.